How does someone become a homeowner? A family in need of decent shelter should apply to their local Habitat affiliate. Each affiliate’s family selection committee chooses families based on their level of need, their willingness to partner with Habitat, and their ability to repay their mortgage loan. Affiliates follow a nondiscriminatory policy of family selection; neither race nor religion is a factor in choosing families to become Habitat homeowners. If your family, or a family you know, is in need of decent, affordable housing, contact a local Habitat affiliate. See the map of affiliates. They can give you information on the availability, size, costs and sweat-equity requirements for Habitat homes in their area and information about the application process. What has Habitat Minnesota accomplished in its 20 year history? In 1997, when Habitat Minnesota was created, Minnesota’s Habitat affiliates were building homes at the rate of 70 per year. In FY 2017, these affiliates served 221 families. In 1997, we broke ground on the 300th new Habitat home to be built in Minnesota. In 2018, we will break ground on the 2,600th new Habitat home to be built in Minnesota. Habitat Minnesota has helped Habitat affiliates by providing funding, financing, and resources totaling over $80 million, including $64.5 million in loan funding, $7.1 million in Federal Home Loan Bank funding, $3.3 million in Impact Fund/CRV funding, and over $5 million in funds raised through the Habitat 500 Bike Ride. In addition to funding, Habitat Minnesota provides training and technical assistance in a full range of areas where affiliates need support. What is the difference between a Habitat affiliate, a state office, and Habitat International? Habitat for Humanity affiliates are independently run nonprofit organizations at the local level providing safe, decent affordable housing for hardworking low income families. Each affiliate coordinates all aspects of a Habitat for Humanity home, including fundraising, building, partner family selection and mortgage servicing. Habitat for Humanity of Minnesota, a State Support Organization, works to support the local affiliates through resource development, advocacy, disaster response, training and technical assistance. Habitat Minnesota uses scale to provide the services and resources that may otherwise be unavailable to affiliates. Habitat for Humanity International is the parent organization overseeing the operations of Habitat for Humanity affiliates throughout the world, headquartered in Georgia. 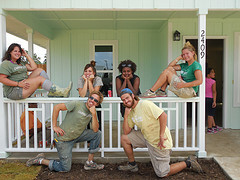 Founded in Americus, Georgia, USA, in 1976, Habitat for Humanity today operates around the globe and has helped build, renovate and repair more than 600,000 decent, affordable houses sheltering more than 3 million people worldwide. How do I volunteer with Habitat for Humanity in Minnesota? Thirty Habitat for Humanity affiliates collectively build approximately 100 new homes and repair 230 homes per year throughout Minnesota. To learn more about volunteer opportunities with the affiliate nearest you, see the map of affiliates. Habitat Minnesota has need of office volunteers from time to time. We also seek volunteers for the annual Habitat 500 Bike Ride each July. How do you become a homeowner? How many homes have been built by Habitat through the years? Habitat for Humanity affiliates have built 2,500 new homes in Minnesota since Habitat for Humanity was started in 1977. Habitat for Humanity is a global nonprofit housing organization working in nearly 1,400 communities across the United States and in approximately 70 countries around the world. Habitat’s vision is of a world where everyone has a decent place to live. Habitat works toward this vision by building strength, stability and self-reliance in partnership with people and families in need of a decent and affordable home. Our Mission: Habitat for Humanity of Minnesota is a statewide resource development and support organization that serves, advocates for and advances the work of Minnesota’s Habitat affiliates to build decent, affordable housing in partnership with people in need. Through volunteer labor and donations of money and materials, Habitat builds and rehabilitates simple, decent homes with partner families. Habitat homes are sold to partner families at no profit and financed with affordable loans. The homeowners’ mortgage payments are used to build still more Habitat homes. Habitat does not give away homes. In addition to a down payment and monthly mortgage payments, homeowners invest hundreds of hours of their own labor—sweat equity—into building their Habitat home and the homes of other Habitat partner families. In Minnesota, there are 30 locally formed and governed Habitat for Humanity affiliates that accomplish home building and home repair activities. These affiliates have built over 2,500 homes and repaired over 2,000 homes in Minnesota. Every year in Minnesota over 30,000 individuals contribute their time, effort, and skills to building or repairing over 300 Habitat homes. What is Habitat for Humanity of Minnesota? Habitat for Humanity of Minnesota, Inc. (Habitat Minnesota) is a statewide resource development and support organization that serves, advocates for and advances the work of Minnesota’s Habitat for Humanity affiliates who build decent, affordable housing in partnership with people in need. Habitat Minnesota was created in October of 1997 by the Minnesota Habitat affiliates it serves for the initial purpose of applying for funding and providing funders with a single contact for the distribution of resources. Since that time, we have added a range of programs to support these affiliates. Like Habitat for Humanity International, Habitat Minnesota is founded on Christian principles. Habitat for Humanity’s work is accomplished at the community level by affiliates—independent, locally-run nonprofit organizations. Each affiliate was created and is governed by members of the community it serves. Each affiliate coordinates all aspects of Habitat home building in its area: fundraising, building site selection, partner family selection and support, house construction, and mortgage servicing. All Habitat affiliates are asked to“tithe”—give 10 percent of their contributions—to fund Habitat’s home building work in other nations. Tithing provides much-need funds for international building, and it also demonstrates Habitat’s foundational belief that we are to share our resources so that everyone everywhere has a decent place to live. How can my affiliate participate in Habitat Minnesota’s programs? Habitat Minnesota offers a wide range of programs to help advance the work of Minnesota Habitat affiliates, including sustainable building support, a loan and grant program, trainings, events, and data. To learn more about each of these programs, see the “For Affiliates” tab above. If you would like to see information about how each of these programs has operated over the past few years, see our Annual Reports for details. How many new homes are built each year and what do they cost? Habitat for Humanity affiliates have built 2,500 new homes in Minnesota. In Fiscal Year 2017, the 31 Minnesota Habitat for Humanity affiliates built, rehabilitated, or recycled 80 new homes. Of those, 51 were built in Greater Minnesota with the remaining 29 built in the Twin Cities Metro Area. Home costs vary throughout the regions of the state, especially the cost of land. Homes built in the Twin Cities cost $190,000 on average. In greater Minnesota, homes built in urban areas average $150,000, while homes built in rural areas average $110,000.